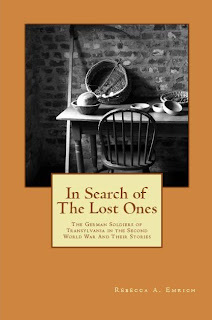 In Search of the Lost Ones is available on Amazon, and is now at a lower price. For me, this is a big event since it showcases Transylvania and the Second World War from the view of the Saxons of Transylvania. As this book is found in a niche market, one where it talks about the village life and how the Second World War changed it, this means a high price is a harder sell. The book is one where people can see a different dynamic to the rise, and fall of one culture of Transylvania, the German Saxons. The other thing that excites me is that it allows people to see into a place and a time when Transylvania was very unique. This is a market and a people where much of what is written about them is limited, and has a small following. This means there were challenges in the art of writing and publishing it. The market might be small, people who lived in Transylvania and were of German origin, but it is an important aspect to Romania's wonderful history. At that time, there were people many different cultures living still there; some were ethnic Germans, some Hungarian, some were Jewish and some were Romanian. There were also Roma and many others- Greeks and Bulgarians. The book describes a time before many left this area for other lands. In Search of The Lost Ones is a means for me to offer another point of view on the people and place that is Transylvania. The Saxons were a group which were unique as they had been invited to the land long before they were removed. However, this book focuses on the Saxons of the area which is a niche market and not on the Romanian population as a whole. In Search of the Lost Ones is my first published book and can be found on Kindle and in paperback. It's short, and I'm proud of the work my team did with me. Transylvania is a part of Romania, and this needs to be celebrated more by as many writers as possible. It is a land of beauty and culture and history. I believe more writers should write about Romania. The main difference between other books out there and mine is that I write about Transylvania from people's recollections of the land. Also, as a side note, there is no Dracula involved.